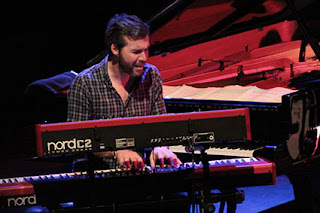 Something of a Northern homecoming for guitarist Mike Walker and pianist/keyboardist Gwilym Simcock, a great buzz of excitement preceded the album launch of The Impossible Gentlemen’s third release, Let’s Get Deluxe, at Manchester Jazz Festival last night. 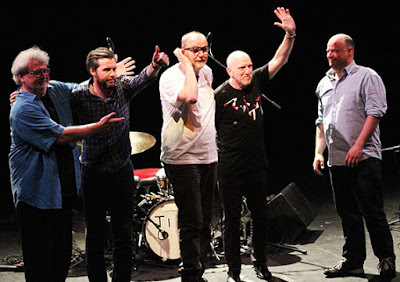 Looking back from the stage of the RNCM Theatre, every one of the steeply-tiered seats appeared to be filled, and a warm expression of appreciation greeted this ‘international supergroup’ as they took up their positions. Alongside US colleagues, bassist Steve Rodby and drummer Adam Nussbaum, the name of Iain Dixon has now been added, providing a seamless woodwind and synth addition to the Gents’ distinctive musical character. The new recording is stacked with layered instrumental textures (most notably Simcock on French horn), yet their live interpretation was a triumph, as revealed in the bright, opening prog-guitar groove of title track Let’s Get Deluxe. Grungy, late-night Dog Time (which Walker explained didn’t quite cut it in his straight Salford accent, but rather pronounced “Dawwwg Tahhhm”) is already an album standout – but here, the guitarist coaxed the most wonderful howls and caterwauls from his fretboard as it melded with Simcock’s double-banked Nord organ tremolo, before erupting into a full-bodied blues rocker with contrasting, mysterious episodes. Dedicated to late, great pianist John Taylor, A Simple Goodbye is one of the most affecting tributes, and Simcock’s delicate chordal eloquence at the grand piano was matched by Walker’s oh-so-subtle string-bent cries – had a pin dropped in the hall, it would surely have been noticed; and blithe, countrified Speak to Me of Home breezed along to Walker’s picked guitar and Dixon’s folksy soprano sax improvisations, expounding on the nursery-rhyme simplicity of its original melody. 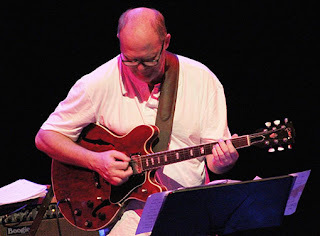 A complex left-hand piano figure introduced shuffling Barber Blues (from the band’s second album), developing to feature delightful bass clarinet from Dixon and lithe bass perambulations from Rodby, with Mike Walker feeling and mouthing every nuance of his octaved extemporisations; and amidst colourful drum soloing, with a few cheeky fake endings, Nussbaum’s cymbal work was positively balletic. Closing the set with an even more energised version of the new album’s Propane Jane, Simcock jabbed away funkily with his effective Fender Rhodes voicing, and those deliciously soaring electric guitar lines from Walker could happily have been soaked up into the wee small hours by this rapt audience. But with that final number announced after just over an hour, never has a concert melted away so quickly, the whole auditorium rising to its feet in genuine gratitude for the beauty they had witnessed (many later taking to social media to declare it “one of the jazz gigs of the year”). Quite rightly called back for an encore, the band’s known playfulness surfaced: as Mike Walker’s guitar became detached from its strap, he genially muttered, “What ‘ave ah dun ‘ere?”, promptly followed by Gwilym Simcock's subtle teasing in the form of a perfect rendition of the Some Mothers Do ‘Ave ‘Em theme at the top of the Steinway! A special evening to savour – and a classy album to own. The Impossible Gentlemen's tour continues at Pizza Express, Dean Street, this Sunday and Monday (31st July, 1st August).